In case you are not in the loop, the term vegan handbag means a type of handbag that is made out of vegan leather or synthetic leather. So how does vegan leather match up to real animal leather? Well, in most aspects vegan leather is much better than animal leather. First, it is much more attractive in that it can sparkle and can be saturated in many different shades that can put real leather to shame. Vegan leather also gives you a killer look without the need to kill animals for their skins. Finally some types of vegan leather eg. cork leather are recyclable, versatile and biodegradable. In case you are looking for stylish, classy and excellently designed tote bag but do not want to cough up $ 200 and above then the Scarleton Reversible Tote bag is for you. This bag from Scarleton is sturdily built, fashionable, and roomy enough to hold all your items including a laptop, all at a very affordable and unbeatable price. Tote bag measures 15.5″ x 13″ x 5.5″. Comes with straps that drop 9.5″. Features a coin bag with a zip closure. Comes with hidden magnetic closures for secure closing. Made out of high-quality synthetic leather that looks like the real thing. The tote bag is reversible and features different colors on both sides. comes in an array of attractive colors to choose from. Round hidden magnets allow for easy opening and closing. Very roomy and comfortable to carry even when fully packed. Great cheap price for the quality of the product. Straps hold up well and do not shred even after continuous usage. Tote bag has no internal pockets in order to make more room. Humble Chic which is famed for producing high quality and stylish women’s apparel and accessories does not let down with this clutch bag. Made out of very soft vegan leather and featuring cutting-edge external and internal design, this clutch bag is in a class of its own. The Humble Chic is versatile and can be used both as a clutch bag when you intend to go light or as a wallet when carrying a larger purse. Bag is made out of very soft vegan leather that feels like real leather. Comes with a convenient 9 ” wristlet strap for secure carrying around. The Humble Chic is light and weighs less than 5 ounces. Package measures 7 x 4 x 1 inches. Made up of high-quality vegan leather. The bag comes with a spacious interior that can hold any smartphone under 6.5 “, credit cards, passport, keys, chapstick, and cash. Comes with a wide range of color options to choose from. Small and lightweight enough to carry around and fit in any mid-sized purse. Does not have any repulsing chemical smells typical of synthetic materials. The product comes at a reasonable price but not look and feel cheap. The Dasein vegan leather handbag is the real deal if you are looking for a properly sized handbag that is both versatile and decent at the same time. Made out of pure faux leather the Dasein guarantees a cruelty-free aesthetically pleasing interior that is scratch-resistant and easy to clean. Additionally, this bag is versatile in its usage, spacious and stylish thereby making it a great gift for ladies of all ages. Constructed using high-quality vegan leather. Features a top zipper closure with 3 spacious internal pockets. Comes with a front zip pocket for easier access. Comes with removable and adjustable 48″ straps. Product measures 12″W x 9.5″H x 5″D. The vegan leather used to construct the bag is eco-friendly. Very durable owing to the delicate stitching. Comes with a wide array of color options to suit your taste. The bag does run big and can fit nearly all your everyday essentials. The Handbag Republic Handbag can be described as a thing of beauty. 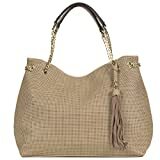 This beautiful accessory is for people looking for a casual bag with a classic design that will stand the test of time. The bag also comes with a smaller purse attached to the inside that can be used to meet all your storage needs. This coupled with the wide array of color options makes it a must buy. Made of 100% vegan leather materials. Comes in a large array of color options. The strap drops up to a length of 5″. Product measures in at 17″x 7″x 13″. Comes with a detachable zipper pouch with adjustable straps. Comes with 2 exterior zipper pockets and no interior pockets. The product does not sport the funky chemical smell typical of synthetic bags. The vegan leather used is Eco-friendly and does not harm the environment. The material used is easy to clean and maintain. The wide color option is sure to fit your tastes and preferences. In case you are looking to travel and have got some items that you don’t want to store in your suitcase then this shoulder bag from Handbag Republic is just the right one for you for you can easily carry a laptop inside. Other than that the bag is classically designed and comes with an additional clutch bag inside that can be carried when you want to go light. Crafted using high-quality premium patented leather. 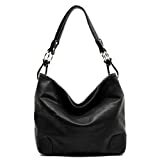 Features a button closure for the tote bag and a zipper for the clutch bag. Comes with a shoulder drop of about 5″. Product measures in at 17.7″x “x 13.7 x 2.7”. Features a wide range of color options. The Tote bag is extremely roomy and can fit a majority of your essentials with the help of the clutch bag. Leather material used is easy to clean & maintain. An eco-friendly handbag that does not harm the environment. A wide array of color options can go with any season. Cheap price for the quality. There aren’t many bags on the market today that can boast of being spacious enough, sustainable and beautiful at the same time; the Corkor Vegan Handbag is exactly that and so much more. 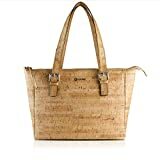 This beautiful bag from Corkor is crafted using natural cork from the Oak tree, which is 100% vegan material hence making it very Eco-friendly. 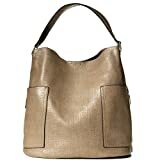 Additionally, it is stylish enough to go along as a shoulder bag or a handbag. Crafted using 100% Cork material. Features a zip closure at the top. Product measures in at 16.9″ x 10.6″ x 5.9″. Handles drop down to 9.8″. Features internal compartment for a tablet, smartphone, laptop, keys and other essentials. Comes with a set of bottom metal footing. Durable product that performs like high-quality leather. Comes with a beautiful brownish rustic look. Comes with a roomy interior. The material used is very soft and smooth to the touch. Looking for an everyday bag that is both big and incredibly stylish at the same time? Then you cannot go wrong with the Elphis Fashion Classic Shoulder Bag. 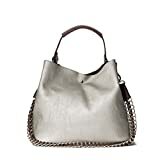 Featuring detachable shoulder straps with silver snap hooks as well a hobo slouch at the center the bag is sure to make a major fashion statement. When it comes to storage it is a beast with spacious compartments that can fit just about any number of essentials. The product comes with a large array of color options to choose from. Features a secure zip closure at the top. Comes with a detachable strap with big snap hooks. Crafted with faux vegan leather. Comes with a zippered center divider compartment. Has a back wall zip pocket. Measures in at 11.5 x 5 x 11 inches. Silver hooks and detachable strap look stylish and classy. Roomy interior with adequate pockets. We all can use a tote bag that is well crafted, beautiful and practical at the same time. Well did I mention affordable? This is exactly what you get when you purchase the Handbag Republic Vegan Leather Denim Tote Bag. This bag is specially designed for people that like rocking the bold dressy and casual look. Crafted with 100% Eco-friendly vegan material. Comes with a metal chain strap with a drop length of about 10.5″. Features a zipper closure for secure closing. Comes with a host of interior and exterior pockets as well as a keychain leash. Measures in at 15.5″x 6.5″x 12″. The material used is easy to maintain & clean. The bag is lightweight hence travel-friendly. Comes with a host of multiple color options to choose from. Offers so much room for your everyday essentials. The bag comes with an incredible array of colors to choose from. Comes with an adjustable and removable shoulder strap with a length of 48″. 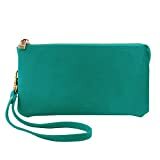 Comes along with a matching color wallet that 8 interior card slots and a removable wristlet. Features a top zipper closure as well as a dual back magnetic snap to help expand top closure. Crafted out of high-quality faux leather. Extremely aesthetically pleasing and eye-catching. Very roomy and can fit most of your personal essentials. Quite affordable at less than $ 50. Most of you will agree that the Corkor Cork Backpack is simply amazing both for travel and school purposes. 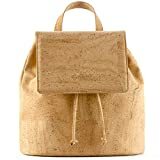 The fact that it is handcrafted by Portuguese artisans using purely cork materials makes it a great choice for people looking for a super trendy bag but at the same time looking out not to harm the environment. Indeed it can be a very thoughtful, practical and unique gift to any special woman in your life. Available in about 5 unique color combinations. Comes with a drawstring top. Features the Corkor Logo at the front. It is a PETA- approved product that is 100% animal free. Product measures in at 11.4″ x 11.4″ x 6.3″. The product is water resistant and easy to clean with only a damp cloth. The neutral colors can match any outfit and any season. The Product is durable and made to last for long. Every product is different due to the unique pattern of the cork fabric. Spacious interior and extremely lightweight. 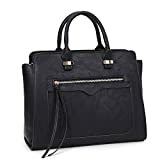 After reviewing the 10 products above, it well evident that vegan leather handbags for women can be as stylish and trendy as leather ones if not even more. Additionally, they are more sustainable since they are biodegradable and cruelty-free to animals. Imagine rocking the handbag of your dreams at an affordable price while being guilty free that no animal was harmed to make you look fabulous; how fulfilling that would be! Well, it is possible if you choose to go for one of the vegan leather products above.